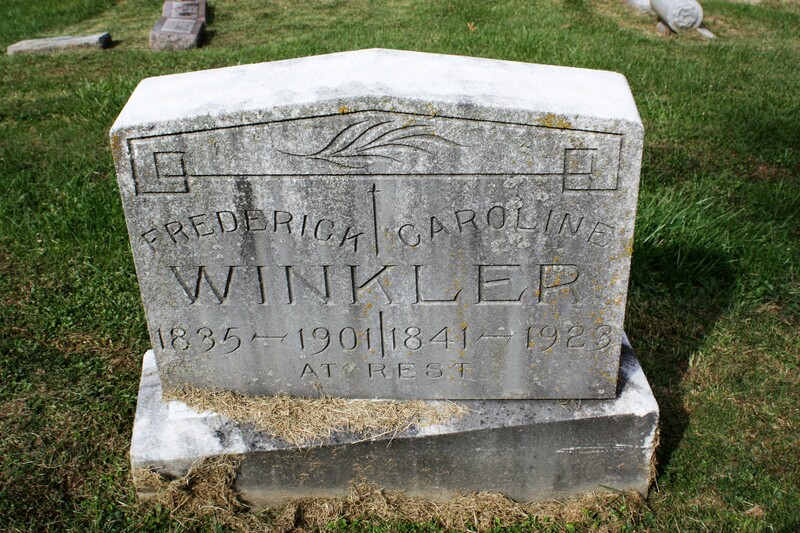 According to the 1900 census for Campbell County, Frederick Winkler and Caroline Ebrink (have seen it as Abbering) had been married forty years, putting that marriage about 1859/60, having had nine children with seven living at that time. Frederick Winkler was born in Switzerland and came to the United States before 1859. Caroline Ebrink was born in Kentucky, but her parents were born in Germany. In the 1860 census the couple are living with Ann Ebrink, 64, Caroline’s mother. Son George, at five months is their only child. Ten years later Frederick is listed as head of household, with wife Caroline and four children, and mother-in-law Anna Ehrbring (another spelling!). In the 1880 census Frederick, 44, and Caroline, 38, are listed with the following children: George, 20; Mollie, 15; Peter, 12; Bertie, 10, Emma, 4; and Elaine, 2. Frederick is listed as a blacksmith. Son Fred was born just after the census was taken. In 1900 two children remain with their parents – Elaine, 22, is a bookkeeper; and Fred, 20, is a tile setter. Frederick shoes horses at this date. Winkler – Frederick H., aged 65 years, at the family residence, 714 Robert Street, Newport, Kentucky, March 14. Funeral Sunday March 17 at 2 p.m. Services at St. Paul’s Protestant Church. Frederick died of paralysis, according to death records. Mrs. Caroline Winkler, 82 years old, died yesterday at her residence, 227 East Tenth Street. 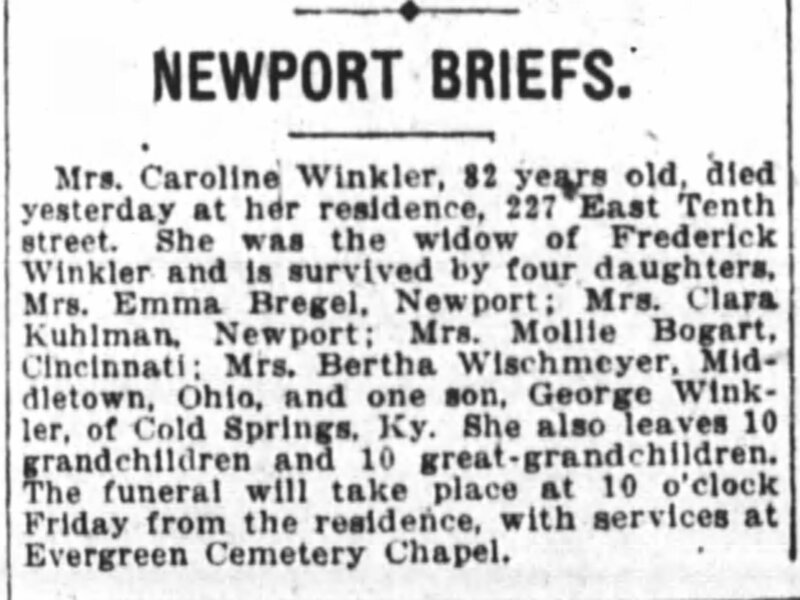 She was the widow of Frederick Winkler and is survived by four daughters, Mrs. Emma Bregel, Newport; Mrs. Clara Kuhlman, Newport; Mrs. Mollie Bogart, Cincinnati; Mrs. Bertha Wischmeyer, Middletown, Ohio, and one son, George Winkler, of Cold Springs, Kentucky. She also leaves 10 grandchildren and 10 great-grandchildren. The funeral will take place at 10 o’clock Friday from the residence, with services at Evergreen Cemetery Chapel. Caroline’s death certificate lists her parents – Henry Abbering and Barbara Ann Gutcherhum. She died of arterial sclerosis. Frederick Winkler, 1835-1901. Caroline Winkler, 1841-1923. Evergreen Cemetery, Campbell County, Kentucky.